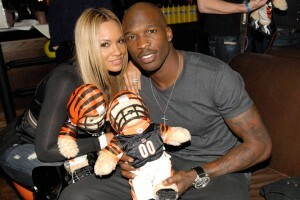 *With the recent divorce filing by Evelyn Lozada against Chad Johnson, we decided to take a look at some athletes whose love lives eventually ruined their brands. Some of those athletes are Tiki Barber, Mike Tyson, Kobe Bryant and Tiger Woods to name a few. We all know about their incidents. The public and media have been more than buzzing after what seems like a domino effect of career and personal disaster for former Miami Dolphins wide receiver Chad “Ochocinco” Johnson. It began with his arrest and domestic battery charges after his new wife Evelyn Lozada accused him of head butting her during an argument over a condom receipt. Then, in what seems like moments after the arrest, Johnson was released from his one-year contract with the Dolphins. To make matters worse, his highly anticipated VH1 reality TV show Ev and Ocho, which would showcase he and Lozada in wedded bliss, was pulled from the network’s schedule, with no future plans to air. And in more unfortunate news, Lozada has filed for divorce. View the rest at BE.